"North Harford Hawks' head coach, John Grubb tells his team, "Let's just play good Harford County lacrosse," in the huddle before the beginning of the second half at North Harford High, Thursday, March 27. Grubb earned win No.300 after defeating Perry Hall, 19-14." Well, my drought of assignments came to an end Sunday where I shot three assignments plus a bunch of work at The Towerlight. Change of pace for this post. Here is another story I thought was a good enough to share from my New Media course. Enjoy. John Grubb’s North Harford Hawks’ were giving Perry Hall a pounding in the first half Thursday afternoon, as they led by nine goals. But then, with five minutes remaining in the match, the decision to start third string in the second half backfired for the coaching legend. His hands clinched the inside of his pockets like vice grips on a rusted bolt and his legs crossed tightly at the ankles, as he continually rose up and down nervously on the tips of his feet. Frustrations flared after another goal rocketed past the goalkeeper and sidelined teammates shouted at defenders on the field. The Hawks, only up by four goals, watched as time and their lead ticked away little by little. 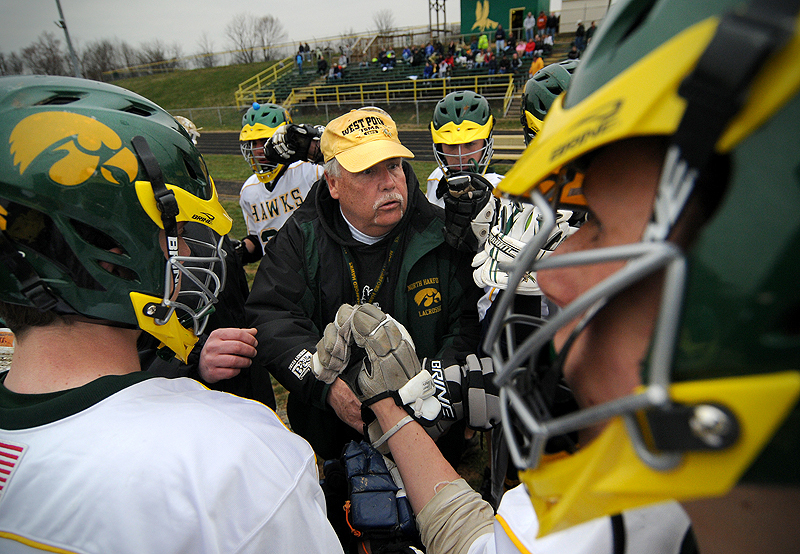 The only lacrosse coach in North Harford program’s history has been stationed on the Hawks’ sideline for 32 years, and this game means more than just another first home game of the season. Grubb has a chance to reach career win No. 300. Lacrosse has been flowing in Grubb’s veins since the ninth grade when he played his first game at McDonough High School in Baltimore, Md. “I got cut from the baseball team and my buddies I played football with were lacrosse players and got me to come out,” Grubb said. From there, a scholarship landed him at Towson State, where he earned All-American honors as a defenseman and was inducted into the Towson University Athletic Hall of Fame. Then in 1977, Al Cesky, head of intercollegiate athletics in Harford County, recruited the social studies teacher and other notable lacrosse coaches, as he filled the schools in the county with lacrosse talent. But before he started tallying nearly 10 wins a year, Grubb endured losing seasons, including a winless campaign in 1979. The following season, he adapted something he learned at a young age and transformed it into a successful coaching strategy. Fundamentals. “That’s all I heard when I was playing - fundamentals. I don’t even think I knew what that meant,” Grubb said. The basics of the game have been a trademark for Grubb and something that past and present players and coaching staff commonly recognize him for. Grubb’s repetitive routine has proven to be profitable, as he has propelled the Hawks’ to two state championships, 12 Harford County titles and was named Harford County coach of the year seven times. While the game has changed dramatically since his arrival at North Harford, more than 30 years ago, that hasn’t changed his coaching style. “[He] adjusts to the rules and little things that need to be adjusted, but I think the reason he is consistently competitive and successful overall, is that he sticks to the basic, time tested drills,” said assistant coach, Todd Grubb, who views John Grubb not only as a father, but mentor and coach. Todd Grubb was a part of the 1995 team, as a player, who won the Class 1A-2A title. Grubb has not only been working on developing the game in Pylesville, Md. with the Hawks, but with kids all over, with a lacrosse camp he started with former Towson State teammate, Frank Mezzanotte. 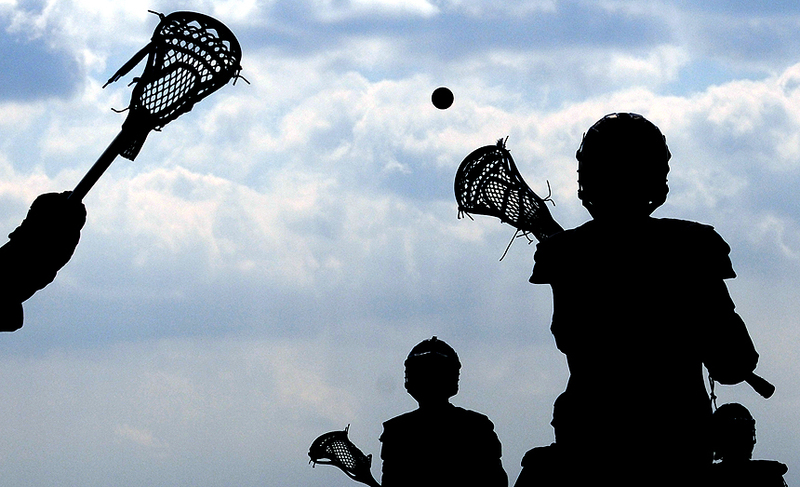 “We realized that to compete with the other counties in lacrosse, we needed to start a camp in Harford County and try to bring in good coaches from outside to teach our kids the game,” Grubb said. 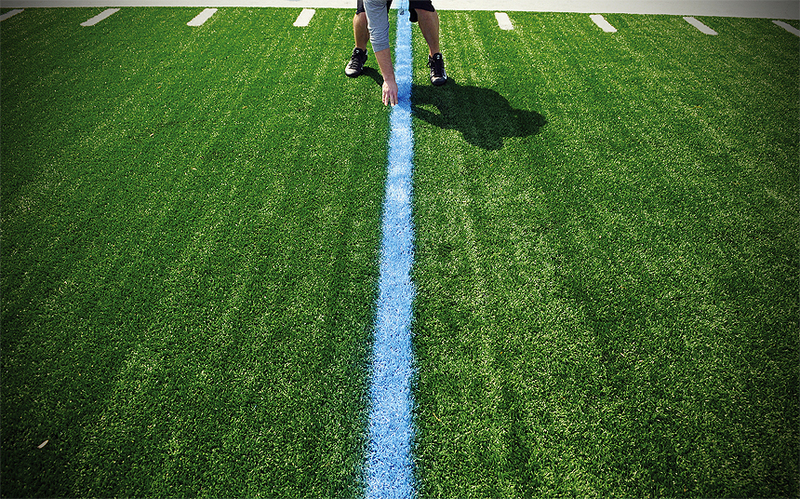 The camp is about teaching and as listed on the Web site, “We build players, one at a time.” In its 27th year, the Towson duo have educated the essentials of the game to nearly 4,000 players of all ages, and recently watched the game progress with its recent branch in South Carolina. But to the most winningest coach in Harford County history, lacrosse isn’t everything. Whether or not members of the 2008 squad will be better prepared for life, they will remember a peak of Grubb’s life as the final whistle sounded Thursday, concluding a 19-14 victory. Following the final handshake, Grubb, modest and laid back, exhibited a quick smile after officially achieving a milestone in his career. But the smile vanished as he received accolades from players, parents and wife. “Are you going to celebrate?” asked Judy Duarte, the mother of a sophomore player. “I’ll probably have a cold one,” Grubb said. I am not writer by all means, my talent lies in my photographs, so I would love to hear some feedback. 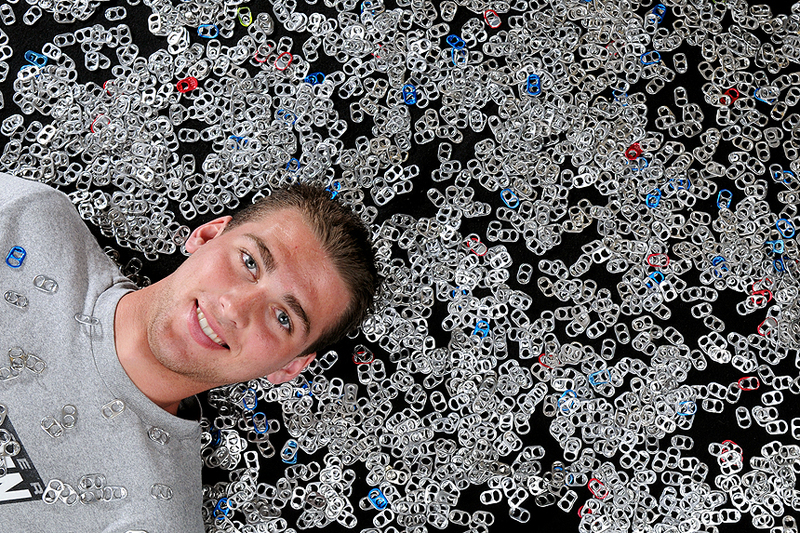 "A mission to “better lives, one tab at a time,” Towson University sophomore business major, member of the honors college and the Tigers men’s soccer team, Tommy Appel-Schumacher has been collecting the tabs off of aluminum cans to donate toward the Ronald McDonald House, and to involve as many people in the effort as possible." For the past week, I've been stressing out about a story I've wanted to do for my second to final Mass Communication course. I've been making phone calls and e-mailing those vital to the story and haven't heard back from any of them. I exhausted all of my resources and have begun searching for a new, less interesting topic to me. With a negative vibe in mind all day, I juggled three assignments on a production day, which means I wasn't only shooting, but editing all the other photographers work and producing some online content. I'll be honest, with so much going on it was tough at times to still be creative, since I was worried about not being able to do my projected story. If anything was keeping me going throughout the day, it was the beautiful weather. Although not planned, one of my assignment’s locations changed and I was forced to walk across campus twice. However, it was relaxing to get outside and exercise a bit in the gorgeous weather. Around 5 p.m., my portrait subject arrived. I had told him to bring some coke-can tabs and anything else that could help tell his story. To my surprise, he brought two big UTZ pretzel jars, overflowing with tabs. With my idea to have him amid a sea of tabs, at first glance, I thought, "OK, these won't be nearly enough to possibly have him surrounded by these things." As he did a video interview for the Web site, I dusted off my lights that have been sitting around for a month, started setting them up and figuring out exactly what I wanted to do. My biggest problem was making sure readers could identify what he would be sitting with. Luckily, thanks to the arts editor (should be called arts and entertainment), Alex, fetched a black fleece Beowulf blanket from the office couch that he received in a press kit. This was vital to making the tiny pieces of aluminum be well defined. With a light color they would have blended in and been difficult to see. With that out of the way, I started pouring and scattering the tabs. Astonishingly, a half jar of these scraps was what you see in the image. That's a lot of coke, caffeine and rotten teeth. When he got into the room, I played around with a couple of scenarios, but having him simply lay among (random fact of the day: I always spell this word with a “u”) them seemed like the best solution. Click. Click. Click. A couple tests and things looked well. I made some minor adjustments and dropped a handful of tabs on his chest and got what you see above. I think it fit the story great, and I must say I loved the lead by Krysten, the writer on the article, "Instead of measuring his accomplishments just in grades earned or goals scored, Tommy Appel-Schumacher, a member of the honors college and the Tigers men’s soccer team, also measures them in aluminum tabs." As I cleaned up and looked at the image on the back of my camera, I knew I was happy with the portrait. Then I got a call and an e-mail. From who? My sources for my highly anticipated story for class. The story is on and a go for today. And if that wasn't a big enough boost, I forgot to mention, I was informed Friday by my buddy Brian Stelter that him and I both placed in a the second of two competitions The Towerlight enters every year: The Columbia Scholastic Press Association 2008 Collegiate Gold Circle. Brian placed third in in-depth news story and I placed first for a portfolio of work. These were both national awards, so I am pretty amped to hear that. Congrats to Brian and me. "Conrad Jay Bladey of Lithicum, Md. waits outside of the Union Garage with his GMC Sierra "Magnet Car" for his daughter, Margaret, who is a freshmen art major at Towson University, Tuesday, March 25. Bladey's GMC Sierra has hundreds of toys either glued or magnetized to it. 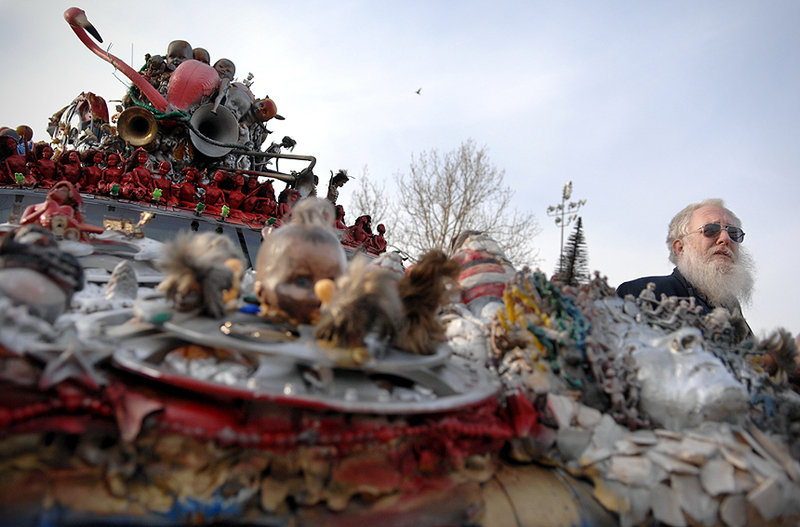 In addition, he owns six art-cars and his daughter owns one." Days like Tuesday are long. A full day of classes in combination with three photo assignments leaves me little to no down time. I had no dinner; a quick lunch and I can't say my breakfast was anything to brag about either. To put it all in perspective, I left my house at 8 a.m. and got home a little after 10 p.m.
Don't get me wrong, I love being busy. I had a blast shooting assignments (not so much sitting in class all morning and afternoon). But when you stumble across people that are not apart of your original scheduled day, it's always an added bonus. Around 6 p.m., I got a call from Sharon, editor in chief of The Towerlight, saying there was something unusual near the Union Garage. Not knowing what to expect, I headed outside with my camera. When I got close, I saw this abnormal looking vehicle from a far. Sharon told me that's what she saw, a funky car, but she didn't know why it was there or who the owner was. I love meeting new people, so I opted to shoot a couple photos than talk to the owner. Everyone has a story to tell. Some evident, others not. For Conrad Jay Bladey (or Conrad) his toy plastered automobile screamed a fascinating story. After firing a couple frames, I simply introduced myself to Conrad, told him I liked his car and did what any curious passerby would do; I started asking him about it. A visionary artist, a teacher and (close your child's eyes) a Santa, he passionately told me of his GMC Sierra "Magnet Car" and his other six vehicles. All of his automobiles have different themes and he said it all started when people started putting stickers and magnets on his car. Also, he told me about his daughter, whom he was waiting to pick up. His daughter, Margaret, also has an art-car; however, it was in an accident, thus being the reason of Conrad being at Towson University. To pick her up. As I stood there gawking at his handcrafted gem, littered with toys held on either by glue or magnets, I made connections to past art-car fanatics I've photographed and realized that this is just another form of art and like me, he has a vision. But amidst the talk of his car and life, the most motivating thing about Conrad was when I asked him why? Why glue sunburned Barbie’s on the roof, Santas and baby doll heads on the hood and scribble quotes on the quarter panels. His response was enlightening, "Anything that can bring a smile to someone’s face." Who would have thought that there are really people out there whose ambition in life is to bring joy to others? Typically people want to make themselves happy first, but that didn't seem to be the case with Conrad. He talked to me about how he would never drive anything that was plain, because it was boring, but mostly because, he too, liked to connect with other people. How many people can say they get out of bed every morning with the goal to make someone smile? I'll be honest; I come first in my life. But I am sure Conrad makes more than his family and significant other smile daily, because it's his goal and all with something he avidly loves to do. 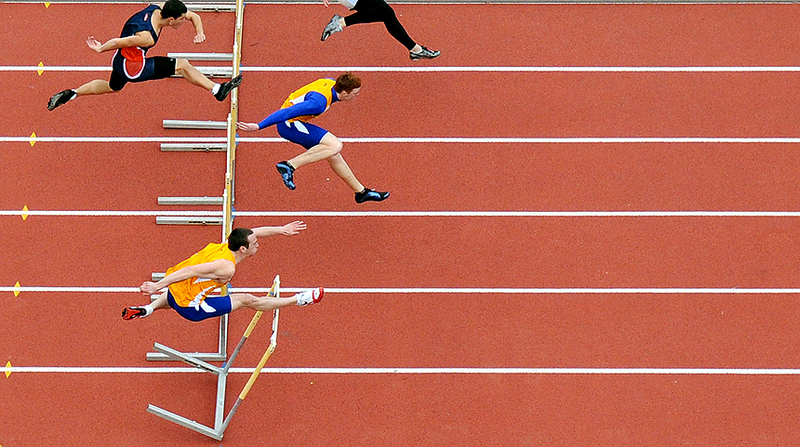 "Competitors sprint and jump as they race toward the finish line during the 110 meter hurdles at the Towson Invitational at Johnny Unitas Stadium, Saturday, March 22." Golly gee willikers, was I surprised that it actually never rained on Saturday. Not a drop fell. Not once. Up until Saturday, no matter where, when or why I have never ever covered a track and field event when it did not rain. Seriously, every time I am scheduled to shoot one the forecast has called for of a zero percent chance of sun. On Friday night, as I gathered my things for the morning, the classic children’s rhyme lyrics repeated itself in my head over and over, "Rain, rain, go away. Come again some other day." The forecast showed a significant chance of rain, so all I hoped for was a brief period of dry weather during the meet. To my dismay, as I rolled out of bed Saturday, the sky was dark and the rain was lightly drizzling. I didn't only have to shoot the track meet sometime between 11 a.m. and 3 p.m., but I had to shoot a portrait downtown at 9 a.m.
As I drove to Federal Hill for the portrait of two brothers, it actually started to clear. The subject of my shoot was fairly interesting. One brother donated a kidney to the other, so the recipient sibling was putting on a concert in his benefit. Apparently you can live with only one, and I found it funny that the brother who gave up a kidney had a much longer recovery time. Anyways, must focus. By the time I pulled up to my destination on Cross Street, the sun was out and the temperature rising. I took advantage of it and shot the portrait outside, figuring I'd be head to toe in rain gear two hours later. All went well, and I got to start my day off with a nice outdoor assignment followed by a great breakfast at the market, which I had not done in about two years. As I ate my scrumptious bacon, egg and cheese sandwich and fresh doughnuts, I moved the portrait images and did some work for The Towerlight. I finally headed out to Towson for the track meet. On my way I wished upon a full stomach that it would not rain and I would finally get to shoot the steeplechase event. Luckily, both of my wishes came true. It was amazing. The steeplechase itself was enough to keep my happy for a week. This event, to those unfamiliar, is an eight lap race or so, where the runners have to jump over multiple fence like hurdles while trying to get over one which has the dreaded water pit on the other side. The first lap and the last lap is always the most entertaining as the runners always bite it or get drenched. (edit: this is what I am talking about). I had a good day shooting the event and made a lot of nice images from the steeplechase, where a crash like the video showed occured. I also shot a lot from above, in an effort to show a fresh view of the events. I know the other five photographers covering the events didn't get the same shots as me because they stayed huddled together for each event. Most of the time, editors want the solid, go to images, but I love being forced to stay away from herds of photographers at sporting events in an effort to search for a unique vision. Well, keeping it brief and to the point. Happy Easter to all those celebrating. Back to normal posting next week as Spring Break is over. 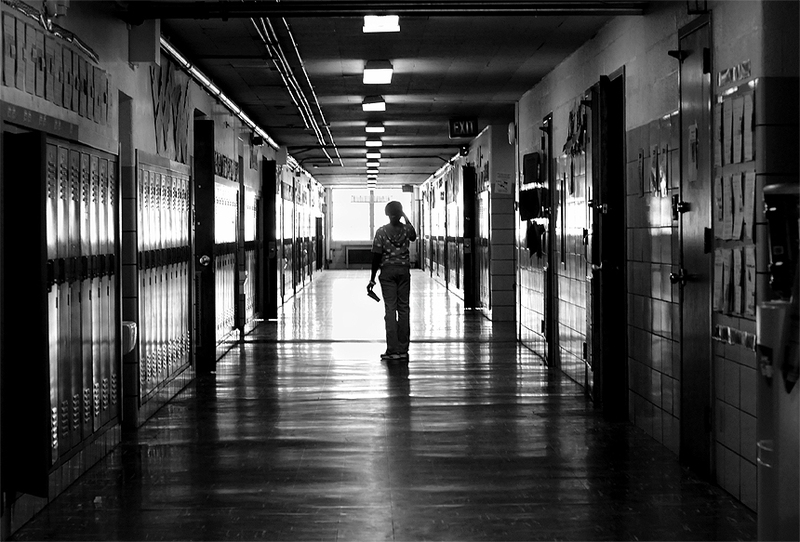 "Alone in the hallway, a lost student attempts to reduce the sunlit glare of the second level floor with her hand as she tries to locate a classroom at Patapsco Elementary/Middle School in Baltimore City on Monday morning." Photography is a dream job of mine, but photojournalism is even bigger dream. On Monday, I was reminded of the wonderful people I often get to meet that willingly let me into their lives and sometimes show what they offer to the world. Although it was an assignment many photojournalists have had, it's a refreshing one that we often over look. On Monday, I ventured down to Patapsco Elementary/Middle School to sit in with Margaret Hoffer's first grade class where Stacy Justice, a Towson student, student teaches. The story wasn't so much about the class, teacher or student teacher, but the overall partnership between Towson University and Cherry Hill. According to Towson University's Web site, "The Cherry Hill Learning Zone initiative represents a partnership among the Baltimore City Public School System, Baltimore City government, Towson University and Cherry Hill's grassroots organizations. Working together, the partnership is leveraging its resources to build upon the strengths of the Cherry Hill community to meet its needs and nurture its potential in areas related to community development, economic development and educational development." Cherry Hill is not a neighborhood in Baltimore City one would want to visit on a Saturday afternoon. With the majority of the households head by single females, with an average annual income of under $20,000, Cherry Hill has the highest concentration of public housing in Baltimore. With the partnership, Towson University students are given the opportunity to intern at the school and give back to the community by improving the quality of life of its residents and youth. I had driven through Cherry Hill with my brothers and father when in my teens and I knew it wasn't a safe place to be raised. So when I got to the classroom Monday morning, I wasn't expecting mid to upper class students like those in Harford County where I grew up. The students were so energized to see someone new in the classroom, but once I hung out for a bit, most, if not all of them ignored me when they became comfortable with my presence. It was endearing watching them sing, dance and learn throughout the day. When the class and teachers went to lunch, I walked the halls alone. I witnessed a fight and more than a dozen students who just wanted their picture taken. Many of them were thrilled to see a photographer and wanted to talk to me. When I was waiting for the class to come back and unlock the room, the (above) girl kept looking around lost. She kept trying to block the glare of the sun when she gazed down the hall, so after I snapped her picture, I asked if she needed help. Although I didn't know where she needed to go, I was eager to help her and not make fun of her for being lost. Being at Cherry Hill and in a first grade classroom for half a day made me realize how important teachers are, and how they can make a difference in children's lives. They are enthusiastic about giving back to the community and helping children succeed, even if the students are from an unfortunate upbringing. It then reminded of those who aren't afraid to give advice to a young kid adult like me. There are some people who don't want to give back to the photojournalism community because they're too concerned with their own lives and being better than you. Those indisposed to help shape the community positively often miss what their job is really about. It's not about making money, being the best shooter or knocking your competition out cold. It's about making a difference for the greater good and giving back to help mold aspiring photographers into successful story tellers. Imagine what the world would be like if teachers didn't give back to students and only cared about themselves? What if they, instead of helping a student, mocked them and betrayed them? It would give a bad name to teachers and diminish the chances of producing talented, educated students. The same goes with photojournalism. If a photographer is unwilling to give back and is only concerned about their competition, what’re they doing for the community other than killing it slowly? It really goes with any profession. As for these children at Cherry Hill, they are getting the teaching they need and deserve. I probably didn't make a direct impact on these children’s lives, but at times when I wasn’t shooting, I took the time to help, interact and socialize with them. For myself, I am fortunate enough to have those in the journalism industry, friends and other photographers take an interest in me, with hopes to help guide me in the right direction. Sure, we all can name a few bad apples that may try to hold us back for being what we want to be, but I doubt they are happy always being negative. When I left Cherry Hill Monday afternoon, I quietly told the Ms. Justice I was leaving and thanked her for allowing me into the classroom. As I headed for the door, a little girl said, "Mr. Patrick, are you leaving?" Before I could even say "Yes," the students got out of their chairs and hugged me. One little girl even said she wanted me to be their teacher. It made my day. It’s the little things that make us optimistic, like: these students displaying a strong effort in school, even if they come from troubled homes, the children appreciating me for who I am and the tiny bit of influence I had on them, and seeing what teachers do on a daily basis by inspiring students and giving back to the community. These things sometimes make your smile and realize that you’re happy and life is good. 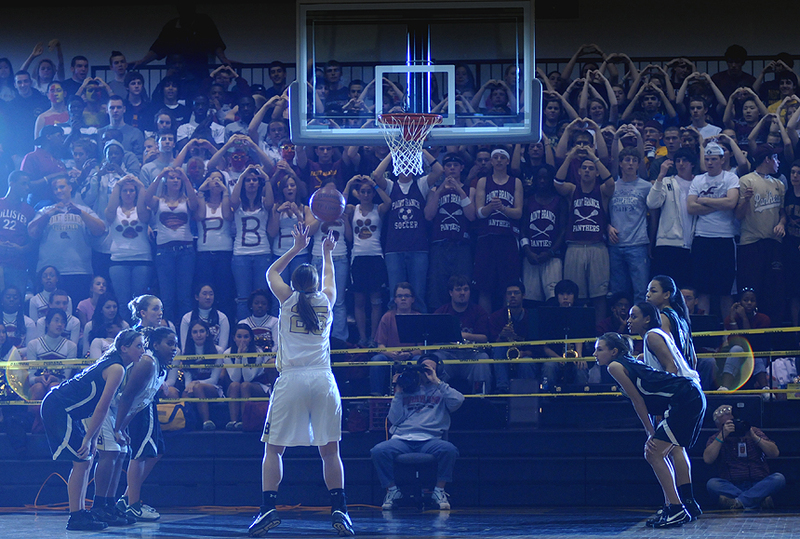 "Paint Branch senior forward Michelle Tabisz attempts a free throw to add to her team's lead during the fourth quarter of the 3A Maryland State Girls High School Championships at RAC Arena at UMBC, Saturday, March 15, 2008. Paint Branch remains undefeated with a 25-0 record after defeating Atholton 74-39." Basketball is over in Baltimore. No more indoor sports and I love it. This means warm weather is approaching, too. But for three local Maryland teams, the season is just beginning with March Madness first-round games. Coppin State, who became the first 20-loss team to reach the NCAA Tournament, will play Tuesday night against Northeast Conference champion Mount St. Mary’s in the tournament’s opening-round game in Dayton, Ohio. Other local favorite team, UMBC, officially became part of the NCAA tournament field for the first time and will be looking to upset the No. 2 seed Georgetown on Friday in Raleigh, N.C.
As for my last basketball game of the 2007-08 season, I shot at the 3A women's title game at UMBC’s RAC Arena on Saturday night. 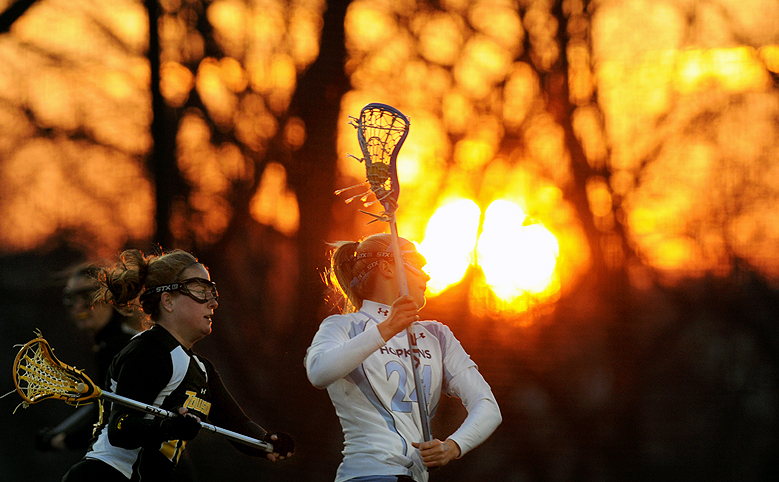 Having shot lacrosse 3:30 p.m. on Saturday afternoon, I opted for the 9 p.m. game over the 5 p.m. match. The RAC Arena is dark (read: dungeon dark). Much like a typical high school gymnasium if not worse. Knowing that, I brought along two Nikon SB flashes and some super clamps to imitate my buddy Dave Hoffmann's approach. I have not used my lights much in couple months, not even for portraits. Well, maybe once or twice. When I shoot basketball, I rarely rely on them, as I would rather keep the fast frames per second and crank up the ISO. The Nikon D300 does will with higher ISO images, so I am fine shooting at 3200. However, when I arrived, even with the D300 maxed out, I was still only getting about 1/320 at f/2.8. There was not much wiggle room either. So after shooting the first half without them, I decided to mount my lights to the railings on the upper level. Although I went through the trouble putting them up and making sure I wasn't interfering with the other radio slave channels of the other photographers, I ended up not even using them much. I shot about half of the third quarter before I spotted fellow Baltimore shooter and Patuxent Publishing Co. staffer, Matt Roth. Matt is an all-around good guy, and one helluva shooter. As I chatted with Matt, I decided to take my 10 minute different shot session. What I am trying to say is, I always dedicate at least 10 minutes to shooting images completely off the wall, especially at sporting events. I'll try anything for an image I've never seen and something atypical to the normal game action. When talking to Matt, I was now shooting into my top level, railing mounted lights from the other end of the court. I kept my white balance set at 3333K, the same from the first half, when I didn't have my lights setup to keep the blue color cast. Just something fresh that works as a feature, although the celebration, the tears and the action ran. "University of Virginia attackman Ben Rubeor, who finished with three goals and two assists, eludes two Towson University defenders during the second quarter at Johnny Unitas Stadium on Saturday afternoon. 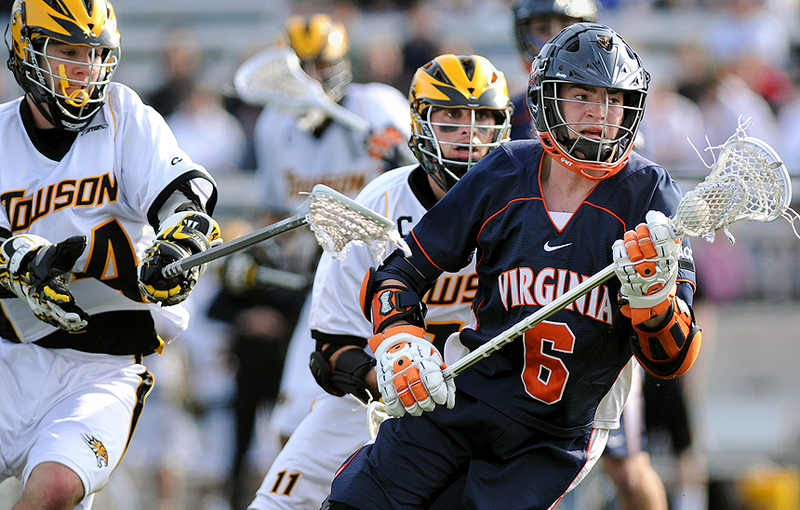 Virginia (8-0) defeated Towson University (1-3), 18-13, in the non-conference game." I've said it once. I'll say it again. Nothing beats a shooting or watching a lacrosse game on a gorgeous Saturday in Baltimore. Saturday was nothing short of being perfect outside, well, it could have been a touch warmer, but the sun out and the sky was blue; so were the Tigers. Out to a great start, Towson came out playing well as the score was 5-5 at the end of the first quarter. I did not think the game would be this close, nor did I think it would be 7-7 as they headed into halftime. However, Towson came out flat-footed as Virginia, undefeated and currently ranked No.3, came out firing, scoring four consecutive goals. From that point on, Towson failed to come back, as the final score was 18-13. Aside from enjoying the great weather and the game itself, I had fun watching Ben Rubeor rip it up. I grew up playing soccer and lacrosse on the same team as Rubeor until high school. The kid was always a little crazy, as I remember him having zero fear and being flat out tough. When younger, we all have a fear instilled inside us that we don't want to get hit or checked too hard and get hurt. But he would just duck his head and drive right to the goal, not caring if he got hacked up. Against Towson, I saw that same crazy Rubeor. 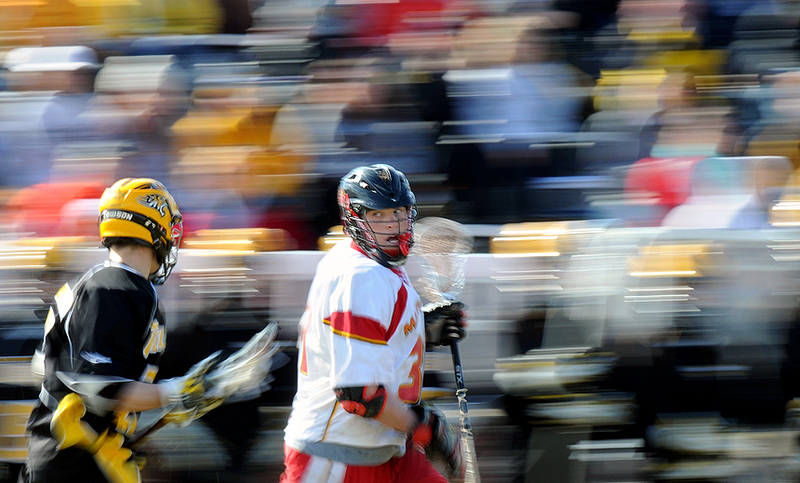 From ripping outside shots, riding on a clear or just delivering punishing checks on a defender. It's no surprise he is among the top 10 best in the sport at the college level. Aside from the Rubeor and Gavin Gill show at Towson, there were many sporting events going on in the region including: Men's and women's high school basketball Class 1A-4A state championships, UMBC and Coppin State's big basketball wins, Johns Hopkins OT loss and Towson women's basketball loss. "Johns Hopkins midfielder Kadie Stamper (no.24) drives past a Towson defender toward the goal in the opening minute of the first half at Homewood Field, Wednesday night. Despite four goal performances by Towson University midfielder Hillary Fratzke and attacker Meggie McNamara, the Tigers fell to the Blue Jays, 12-10." Woo-hoo. Officially on my last Spring Break of my undergraduate college career. Woo-hoo Spring Break 2008! Don't get too excited, I am not going anywhere fun. I'll be staying at home working on homework, trying to relax and yep, shooting assignments. The relaxation part is well deserved after a long, long Wednesday. My day unofficially started 3:14 a.m. when I randomly woke up needing a drink. But being addicted to checking my e-mail, well, I checked my e-mail on my iPod touch, which I often refer to as my iNottaPhone before passing back out at 3:17 a.m.
Officially, I would say my day began at 6:45 a.m. when I unofficially woke up, took a shower, got dressed and ate my breakfast of champions (read: a banana, a Gatorade and one bagel). After my on average 35 minute commute to Towson University turned into a 55 minute nightmare, I grabbed my gear for NFL Pro Day. Pro Day ended around 10:45 a.m., a lot longer than I had anticipated, but I had some time to burn and was at least outside all morning. At this point, I had officially woke up. Around 11:00 a.m., I ventured into The Towerlight office to start downloading, editing and captioning images for the next days paper. From about 12:30 p.m. on, I made some calls to get other photographers work in and ordered some lunch from China Best (or is it Towson Best)? Either way, good food and cheap lunch specials. Tummy (as Bear Grylls would say) full, I started archiving some photos before escaping for an hour to run some much needed errands. Last week, I noticed my 70-200 f/2.8 had seized, so I headed out to ship it off for repair. Around 4 p.m., I ran (not literally) out to the baseball field to cover the game and a possible 500th win for a Towson coach. Apparently, Mike Gottlieb became the first Towson coach in any sport to earn 500 victories. However, although I got to the game during the fourth inning, stayed until the end of the game hoping for a win, in which they got locked in during the eighth inning, nothing short of a dull moment happened after the game ended. I had overheard talk of players planning on dumping water on the coach, but it never happened. I don't even think the coach cracked a smile. Odd. After moving a baseball image, I headed back to the office where I spent some time looking at what the section editors had for layout, gave them some pointers and made sure they had cutlines spelled/styled correctly. I grabbed a quick dinner, Chick-fil-A, and pigged out in my car before pulling into the media lot at Johns Hopkins for the women's lacrosse game versus Towson. It was freezing outside with some gusting winds. My hands; numb. At half time I decided to blast my heat in my car for 15 minutes. But then I realized I had forgotten my computer, so I couldn't edit or move any images. By 9:30 p.m., after the Tigers lost in a close game, I was back at The Towerlight, all images in, all the photos laid out of each page and walked out the door. My day was long, but I wouldn't want it any other way. Well, maybe a news assignment in there somewhere. The above image is just something different at the opening of the game. I got maybe three minutes to shoot some different images using the sun. 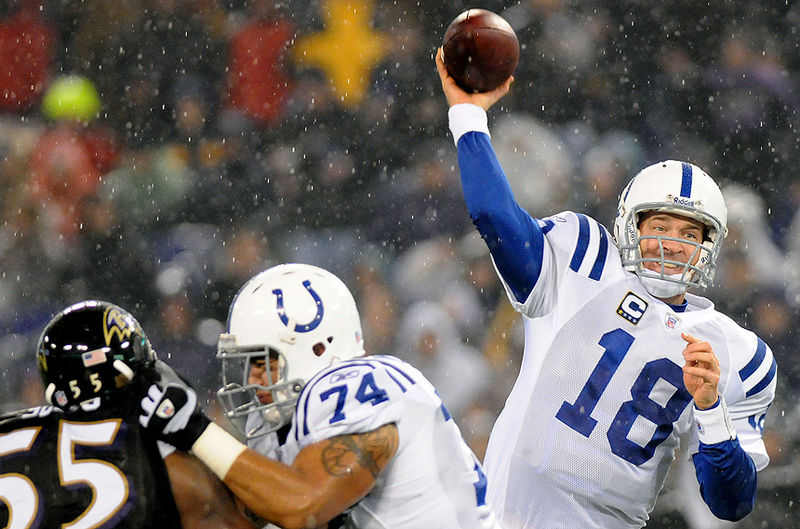 This weekend is pretty jam-packed with more sports...and rain. 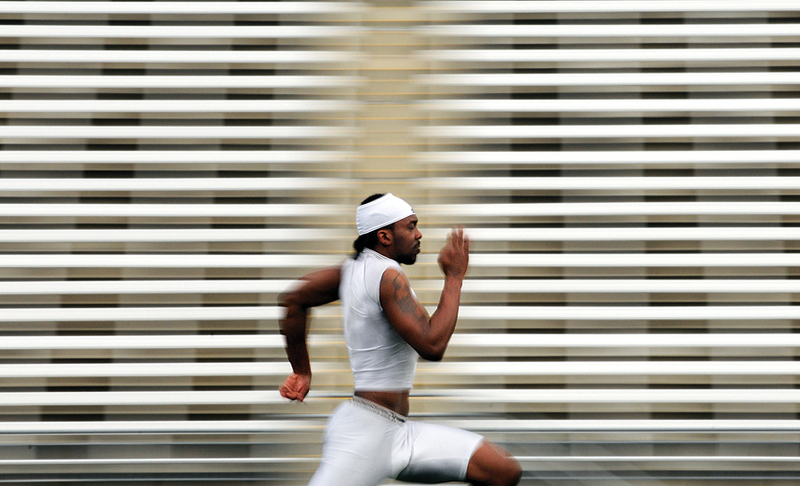 "Towson University senior linebacker Brian Bradford practices various drills he and about 10 other teammates will be tested on during the 2008 NFL Pro Day, which will be held at Johnny Unitas Stadium, Wednesday, March 12. According to NFLdraftscout.com, Bradford is rated number 67 out of 238 outside linebackers." I'll be honest, I am not really looking forward to Wednesday morning. Not because I have to wake up early for an assignment, but because it will most likely be a long day. Monday afternoon I hung out with two of the Towson University NFL hopefuls, Brian Bradford and Eric Clark, as they trained for the upcoming 2008 NFL Pro Day. Towerlight colleague, soon to be Towson graduate and new b reporter, Matt Vensel is basing his story is more or less about Bradford, but I will still be covering the entire event. Last year, I shot the event for the first time focusing on now Towson alumnus and now New Orleans Saints tackle, Jermon Bushrod. The one-day event is much like the NFL Scouting Combine, but to a lesser degree. Conversely, at Towson a only a handful of athletes show up to try and impress a select amount scouts. They are put through everything from being weighed and bench pressing, to running the 40-yard dash and other agility drills. Although it's fun to try and make images of an event that is straight forward, last year I wasn't treated with any respect by those running the event. So that's why I am not looking forward to the assignment. It was if they were more concerned on what the media was doing, rather than the players trying out and themselves. Monday was perfect example that tomorrow will most likely be the same when a scout said bluntly, "I know you're not taking my picture," My response, "Nope." His reply, "Good, better not be." I mean, come on. I am only doing my job, no one is forcing you to be out here. Now, I am playing devils advocate and this year could be different, but I will always remember last years signature quote all the media remembers. The saying goes, which was directed toward me as I shot pictures from a distance with a 300mm lens of Bushrod stretching, "Hey photo guy, that's what the lens is for, back the hell up." I'll be sure to update with the event, a possible 500th win and a big game that could bump the Towson women's lacrosse team into the Nations Top 20 list. On a side note, I regret to inform that fellow Baltimore photog, Baltimore Sun staffer Chris Assaf's blog is done. Or as he said, "###." I don't know the reason (yet), but if it was over what we discussed on assignment a month ago or so, that's pretty lame. Hopefully Chris will continue to blog else where. Until then, catch up on his wisdom, insight and photographs on his blog while it still occupies a place on the Web.